I love being a part of a book club as it opens my eyes and allows me to read books and discover authors that I wouldn’t necessarily come across otherwise. 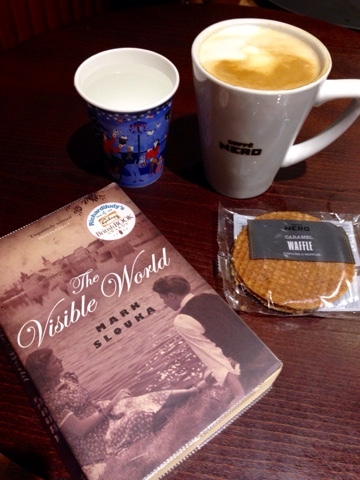 This month’s book was a very charming but typical war-time romance novel; The Visible World. It wasn’t exactly my cup of tea but I found it quite an interesting read as the main characters were from the Czech Republic and having just visited Bratislava in Slovakia which was just on the boarder, it seemed the perfect time to read it. As a boy growing up in New York, his parent’s memories of their Czech homeland seemed to belong to another world, as distant and unreal as the fairy tales his father tells him. It is only as an adult, when he makes his own journey to Prague, that he is finally able to piece together the truth of his parents’ past; what they did, who his mother loved, and why they were never able to forget. The novel was split into three different parts. The first section was all about the boy’s life growing up and his observations of his mother and father’s relationship. The second section was about the boy making the decision as a grown man too go to Prague in an attempt to piece together his mother and father’s past during the war. The third and final section was titled Novel, in which the boy, using the information he had learnt about his parents, created a fictional story that attempts to piece together the story of what happened. I really enjoyed reading this book and it was the first that I have read by Slouka. It was an easy read filled with romance and a boy’s need to understand why his parent’s relationship was the way it was. It was similar to Titanic in that there was a fleeting yet powerful relationship between two characters that was based around a true and historical event. It brought to light the sufferings of Eastern Europe during World War Two and provided a small insight into the world of that time. It was a great historical fiction read that I would recommend to anyone that loves a period drama with a tragic love story. Have you ever read anything by Slouka? Would you recommend any books that are similar to this?